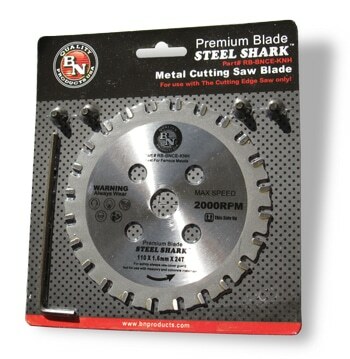 This is just a short note to tell you that we have made a change to the replacement blade and packaging for our popular BNCE-20 Cutting Edge Saw. Working with several of our best distributors and their customers we have redesigned a new blade that is stronger & cuts longer. We have also made a decision to include the four screws to mount the blade to the product and have added the Allen wrench to change the blade on the tool. Because of the larger quantity production runs on this new kit we have been able to keep the price the same even with all of the add-on’s.
. . . or drop us an email.